You've always had a "wild" side, and suspect you may have been at least partially raised by a pack of benevolent apes. You enjoy long walks in the jungle (and by "walks," we mean swinging from vine to vine and hunting ferocious, predatory beasts), and use monosyllabic pickup lines. You know, like "Me (your name), You (her name)." And that's totally cool. We respect that. It works. But have you ever felt like you couldn't really let that wild side out? That you couldn't truly be yourself? 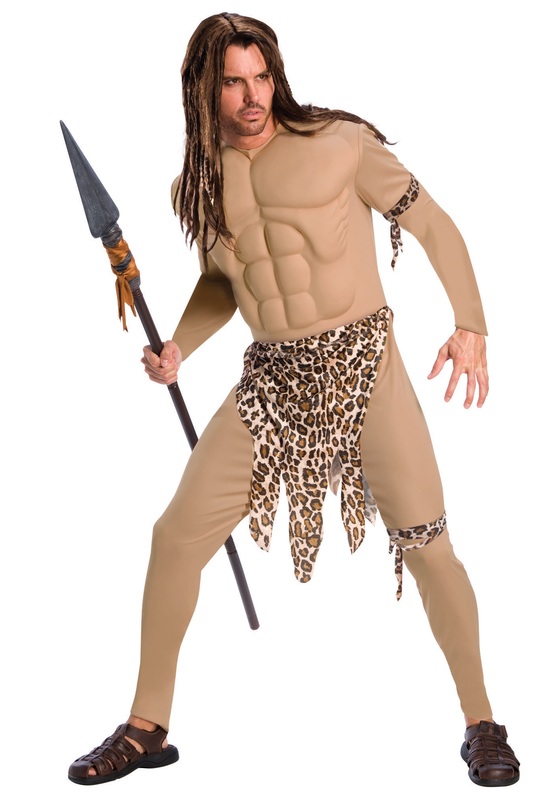 Well, for at least one night (Halloween might work), be who you are at last... in this awesome Men's Tarzan Costume! You are Tarzan, king of the jungle, John Clayton III, Lord of Greystoke, in this neck-to-toe jumpsuit. It includes a padded chest that'll let you achieve Tarzan's muscular look without having to go the jungle gym every single day (sorry, we couldn't resist). The suit also comes with arm and leg ties, and of course, Tarzan's signature leopard-print loincloth. But in this full body suit, you can bring out your inner Tarzan... without having to worry about breaking decency laws. And plus, what if it gets cold on Halloween? This killer costume's got you covered. Literally. There's an added bonus if you and Jane have a little one to bring along. The Men's Tarzan Costume is also available for toddlers, so order one for you and the baby for that big night out in the jungle. Just don't forget a Tarzan wig, and you're good to go!